Imagine a shoe cover that combines a waterproof, heavy-duty outside layer and a fabric inside layer, providing you with optimal durability so that you will be prepared for almost any environment and application. These Hybrid waterproof overshoes are fantastic for rugged uses requiring increased durability. They would be ideal for your food processing or manufacturing plant, or any other environment where durability is a necessity. The plastic serves as a moisture barrier, ideal for your waterproof shoe cover needs. Hands down, these are our most durable covers for shoes, and can be easily loaded by the bundle into our Fusion or Stay automatic shoe cover dispensers for optimal efficiency and cleanliness. Try our Hybrids today and discover why we love them. Each bundle contains 70 fabric and plastic shoe covers. Fifteen (15) bundles are included in a case for a total of 1,050 waterproof shoe covers (525 pairs). These are the same as KBCP525 shoe covers. 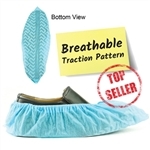 Each bundle contains 70 disposable waterproof shoe covers. Fifteen (15) bundles are included in a case for a total of 1,050 shoe covers (525 pairs).